All orchids have roots and most have leaves, but do we really understand the purpose of these major plant components? Orchids do not have a main (or tap) root – many roots may emerge from the base of the pseudo-bulb but these are classed as adventitious roots, being the same as those that are sometimes produced at other locations along the pseudo-bulb. Leaves come in a variety of forms, ranging from some that are cylindrical in cross-section to others that are flat and papery. Many orchids rely on their leaves (small as they may be in some cases) as their only reserve of moisture in times of drought. First, let’s look at the roots. They are not provided to hold an orchid in its pot, although they do come in handy for that purpose. The root system is the orchid’s farmland, where it gathers water and nutrients and transfers them to other parts of the plant. If we cut an orchid root at an oblique angle, we can see that it is made up of three concentric rings. The outer ring is similar to a sponge – it readily soaks up water and dissolved nutrients and passes them to the middle ring, known as the cortex. The outer ring, called the velamen layer, is usually whitish in colour when dry or moist but has a greenish tinge when fully saturated with water. As moisture passes from the velamen to the cortex, the velamen draws in air, which forms a barrier that prevents water from being returned to the atmosphere, so helping the plant to preserve moisture for as long as possible. 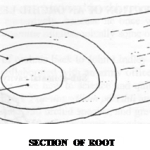 The cortex then passes on its absorbed water and nutrients to the inner ring, known as the pith. The channels (vascular bundles) within the pith contain xylem bundles and phloem tissue that then transfer the moisture and its dissolved nutrients to other parts of the plant. Although some orchids do not have leaves, they play an important part in the health of most orchids. It is there that water and carbon dioxide (a trace component of air) react together, under the influence of sunlight and a green catalyst called chlorophyll, to produce various sugars. These, in turn, are processed into cellulose – the ‘bricks and mortar’ of all plants. The upper surface of an orchid leaf has a smooth waxy texture, and is designed to reflect heat and act as a waterproof jacket that protects the outer leaf cells. 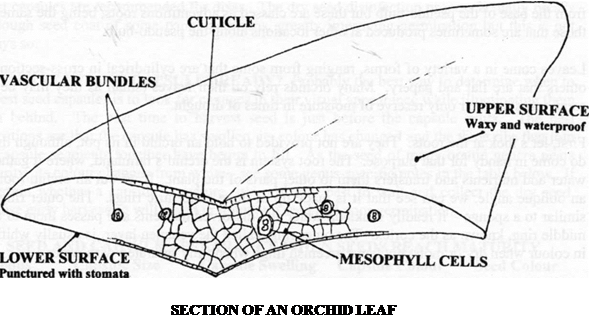 The lower surface of the leaf is usually shaded from sunlight and it therefore has a much thinner protective layer. 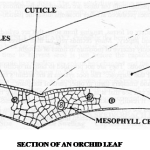 This layer is pierced with thousands of minute slits (known as stomata) that the plant can open or close as needed. 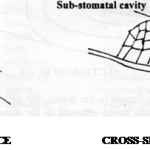 Beneath each stoma (the singular of stomata) is a cavity in which water andcarbon dioxide are held before they are converted to sugars etc., as described above. The number of stomata varies widely within different orchid genera, ranging from 800-18,000 per cm2, with a mean of about 3000 per cm2 – an incredible number, when one considers that 1 cm2 is about the area of a fingernail! The above facts have raised some answered questions in my mind. If orchid roots act like a sponge and soak up water and dissolved nutrients, why should we water our plants before we fertilise them? It seems to me that if the roots are already saturated with water, most liquid fertiliser subsequently applied would run to waste! If the upper surfaces of the leaves are waxy and waterproof, why do we foliar feed our orchids? It seems to me that the only benefit that foliar feeding offers is the fertiliser that runs off into the pot and is then absorbed by the roots. Literature. G.C. Morrison, The Essentials of Orchid Growing, Kangaroo Press (1991).